A big thank you to Geoge McKenna for submitting this great photograph of St Bernard’s Boys’ Club to the website. 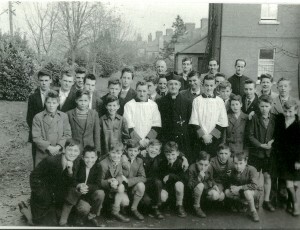 The photograph was taken about 1958 and George would like to know if anyone out there can recognise any of the lads in it and if there is a chance that some of them may still be in the land of the living. Now George didn’t say if the photo is connected to Cabra or not, maybe he’ll enlighten us on that. So I’m just assuming it is. If you click on the photo it should enlarge it for you to get a better look at the faces.